1066 was a common year in the Gregorian calendar and Anno Domini. The year is considered by many historians to be a turning point in history due to various events (see below), particularly the Battle of Hastings and ensuing Norman conquest of England, with years prior to 1066 being the late Dark Ages and years after 1066 being the Middle Ages.Often erroneously labeled "the last successful invasion of Great Britain", it was in fact the last successful conquest of Great Britain (the last successful invasion of Great Britain in general -by the Dutch in 1688- was upon invitation by Parliament to overthrow King James II of England). January 4—Edward the Confessor dies. The Witan proclaims Harold Godwinson King. January 5—Harold II is crowned King of England at Westminster Abbey . 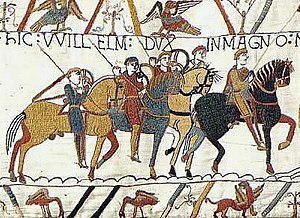 March 20 – Halley's Comet reaches perihelion, it is subsequently recorded in the Bayeux Tapestry. September 20—Battle of Fulford : King Harald III of Norway (Harald Hardrada) defeats the northern English earls Edwin and Morcar. September 25—Battle of Stamford Bridge : King Harold II of England defeats the Norwegians under Harald Hardrada. September 28—Duke William of Normandy, lands in England at Pevensey . October 14—Battle of Hastings , fought between King Harold II of England and Duke William of Normandy: Harold is killed and William is victorious. In England this is the traditional end of the Dark Ages and the start of the Middle Ages. December 25—Duke William of Normandy, is crowned King William I of England. Magnus II is crowned King of Norway. The first black Africans in modern-day Gambia convert to Islam. December 30 – Granada massacre: A Muslim mob storms the royal palace in Granada , crucifies Jewish vizier Joseph ibn Naghrela and massacres most of the Jewish population of the city. Shen Kuo receives a post in the capital. Hedeby is destroyed by a Slavic army and permanently abandoned. Sima Guang completes the compilation of a large dictionary, an important work of Chinese lexicography. Imam Bayhaqi Eminent Scholar of Islamic Faith.